Why am I so thankful? About 9 years ago we had no RV of any kind. 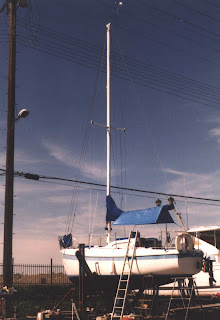 We did, however, own a 26' Columbia Sailboat we kept in the water near Belmont Shores, CA. We became the owners of that vessel in 1992 quite by accident. A long time friend of ours, who lived aboard his 38' Scandia double ender sailboat in the Long Beach Downtown Marina at the time, called one day to tell us there was this sailboat for sale for $800, and that if I didn't buy it I was stupid. Well......no one likes an intelligence challenge more than I. Anyway, the long and short of it is we drove down to see the boat, and bought it on the spot. It was an amazing deal. The economy at that time was in the tank, and the market for boats of any kind was also in the tank. The fellow who owned that sailboat had health issues, and needed to sell it as he was moving to Colorado, and had run out of time. The lease on his slip had run out, and the boat was moored on an "end tie" on a day to day rental. In just a few more days he would be forced to donate it to the Sea Scouts to be scrapped. We were in the right place at the right time. It was well equipped, and presented an opportunity to us to expand our horizons. We had visions of our children really getting into sailing with us....trips to Catalina Island, and eventually the other Channel Islands danced around in our heads. 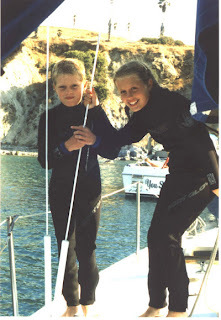 The kids never really got into sailing, however, we did make numerous trips to Catalina Island with and without our kids over the 10+ years we owned the Columbia, however, we mostly did "dock" sailing. We would drive down on a Saturday afternoon every few weeks, spend the night on the sailboat, and drive back the next afternoon. Elaine and I used it as a getaway place where we could spend 24 hours every few weeks by ourselves (we had 5 children living at home at the time). In 1992 our oldest son had purchased his first RV...a Fleetwood Gear Box trailer. I would hear stories each Monday I came into the office of their adventures with their in-laws that weekend camping at Glamis, Dumont Dunes, El Mirage (a dry lake in the upper desert not to far from where we are now). Eventually my daughter-in-law came to me one day saying her mother and father were selling their Fleetwood Tioga Class C motorhome and were we interested? We had been talking about selling the Columbia and buying a trailer so we could spend more time with our son and grandkids, so it didn't take us long to sell the sailboat, and buy the 1987 Class C motorhome! Our first trip with my son and his in-laws was to Lake Tahoe. I had been going to Lake Tahoe since the early '50's with my parents, and every other summer with my wife since we were married....we, in fact, spent our honeymoon at Lake Tahoe. Well, after 10 days on the road in that Class C were were hooked on the life style, and even began to talk about living full time in an RV when we retired. Over the next 4 years we put around 15,000 miles on that Class C mostly in the western half of the USA, and fell more and more in love with the lifestyle. After returning from our longest trip yet (over 3 weeks) to Yosemite, Lake Tahoe and Mammoth Lakes (in the Eastern Sierra) we came to the conclusion that if we were serious about fulltiming we were going to need a bigger motorhome. About that same time, my son, who had progressed from the 30' Gear Box to a 42' Road Warrior 5th wheel, and then to a 38' Fleetwood Class A diesel pusher (with 4 slides) suggested that we look at something like he had. Well, the one thing we knew for sure was that we did not want a loan payment, and if we went that route we would have to finance....I think his cost around $100,000. We decided we would try and find something around 10 years old that we could afford to purchase free and clear. The time was late 2007, and I spent a few hours a week cruising the RV for sale sites looking at used rigs. We had decided we didn't want slides...one more thing to break. We were looking for a "low tech" coach that had systems I could work on myself. In early 2008 we went to the big RV show at the Pomona Fairplex and spent the better part of a weekend going from RV to RV. Nothing really struck my fancy....they all looked the same inside, no matter the manufacturer. The benefit of spending those two days looking at new coaches is that it helped us narrow down what we were looking for, and from which manufacturers. The key was to find something durable, well made, in good condition, in our price range. We found a number of coaches that interested us (Safari's, Monaco's, Rexhaul's, etc. ), but the rigs in our price range, between 5 and 10 years old were just threadbare, and in most cases needed to have the carpet replaced, upholstery redone, wood floors refinished, had prior water damage, etc. Then, in late February I was cruising Craigslist....just typed in diesel pusher in the search window.....one of the first items that popped up that day was a 1982 Newell. 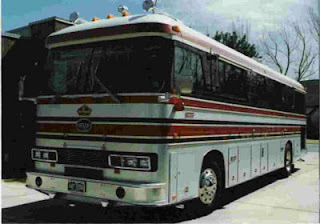 The picture in the ad looked like a bus conversion. I had never heard of Newell, but I showed the picture to Elaine. The coach was listed as being in the Thousand Palms area near Palm Springs. Well, as luck would have it we were going to Indio (also near Palm Springs) for a wedding that very weekend, so she says "Why don't you contact the people and see if we can take a look at it while we are down there". What could it hurt? We were going to be there anyway, so I e-mailed the person suggesting a rendezvouz that weekend, and within just a few minutes I received a call from Fred, and older gentleman. We set the time and made our plans. We were planning to drive our Class C down to Lake Cahuilla and camp that weekend while attending the wedding and reception. We drove down Friday afternoon (Elaine following in the T-Bird), and met with Fred the next morning at the storage facility where the Newell was kept. We walked up to the coach, and knocked on the door. Fred greeted us and invited us in....Elaine entered first, and before I got to the top of the stairs, following her, she had already fallen in love......with the Newell. I kid you not! In her mind it was already ours. I'm thinking, "What on earth! This thing is 26 years old, and I've never heard of a Newell before! Are they even in business anymore? What the hell is a 2 stroke Detroit Diesel? ".....I'm seeing visions of a money pit.....but Elaine has already moved beyond that, and now I'm playing catchup. My good friend, whose wedding we were attending, told me he knew about Newells, and that they were still in business, and they were very well built. Fred gave me a 2 hour tour of every basement area of the coach, and every system inside and out. The coach was in immaculate condition, and we found out later, had been stored inside a warehouse for 22 of its 26 years of life. He invited us back on Sunday to look at it a second time...that afternoon, and evening after the wedding, I spent several hours on the computer reading about Newell, and Detroit Diesel 2 strokes, etc. By the next afternoon when we returned to visit Fred it was just a matter of discussing the details of the purchase. The price was right, and by March 1st she was ours. We love serendipity, and that moment in time when I stumbled across the Craigslist ad so smacked of serendipity, and the subsequent days as everything fell into place, were truly serendipitous! We have never looked back, and now, coming up on our 4th anniversary of being Newell owners, we are so THANKFUL we again were in the right place at the right time back in February of 2008! We had planned on our next RV being a transitional one, but, instead, found our future home. We can't imagine owning another RV. So, now you know the rest of the story, as Paul Harvey often said in his weekly broadcast. On this day of National Thanksgiving we have much to be thankful for.....our children, grandchildren, health, retirement, and yet untold adventures to come. Thank you for stopping by, and may God Bless each of you on this special day! We returned to our home park last Friday to rain, so we had to set back up in the rain, just as we "took down" in the rain up in Ventura. Of course, it didn't rain most of the 2.5 hour drive home, but it rained on each end. Saturday I had 4 soccer matches at the San Bernardino Soccer Complex in Highland, CA. The weather was cool...for a change, and the day was uneventful. Sunday was a different matter....I had 4 matches scheduled at U.C. Irvine (Irvine, CA), and the weather forecast told of rain starting that morning and lasting most of the day. My first match was at 7:30am, which means I had to leave Riverside around 6am in order to be there 45 minutes before match time. The match got underway to threatening skies, but it was NOT raining yet. We managed to get in 70 minutes of an 80 minute match before it started drizzling, then raining.....that was my match as center referee. The remaining 3 matches I would be an assistant referee. The second match began at 9:15am, and within 20 minutes my sideline was a 50 yard mud path. By the end of that game (a 90 minute match) I was muddy from the knees down, and my shoes resembled large mud clods than shoes. My next match was not until 1:15pm so I decided to take my wet stuff back to the parking structure, and my car, to change into some dryer clothes, and shoes, and steel myself for the next game, and more mud. While I was at the car I got a phone call from the center referee assigned to the 11:15am match saying the replacement assistant referee had not arrived, and would I come back and take his place until he arrived? OK, fine.....I walked back to the field munching on a half sandwich, and arrived a few minutes after game time. The missing referee arrived at half time and graciously offered me half the game fee for filling in for him, which I gladly accepted. It was then I found out this was the last game of the day.....the organizers had decided to cancel the rest of the games that Sunday as the fields were in horrible condition after 3 hours of heavy rain.....so I got to go home 4 hours early! 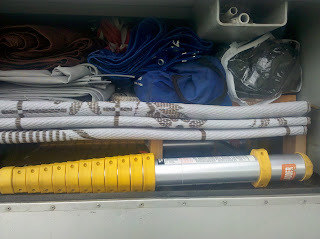 The rest of the week saw Elaine and I reorganizing some of our basement storage areas in the coach. 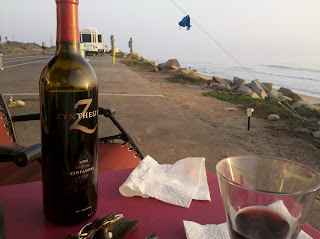 We had discovered on our trip to Ventura that some things we use when dry camping were left in the trailer, and there were many things that we rarely use. So, we spent the better part of the day pulling things out of several of the storage areas to be sure only the things we need for short trips are there. Amazingly, we have a lot of room left. Somethings went up to my office warehouse where they will remain until we depart. One of the storage areas had room for a shelf, and so we installed a shelf thereby increasing it's capacity by almost twice....very nice! Pictures to follow. On Tuesday and Wednesday I applied a wood sealer to the plywood pedestal the new toilet sits on to better protect the wood in the event of another leak. Then Elaine created a paper pattern of the platform which we used to modify the carpet piece we had purchased to fit around the toilet base. Instead of stapling the new carpet in we decided to use stainless steel screws with beveled washers so, in the event of a future water leak, we could simply unscrew the carpet and easily remove it, instead of removing 84 staples....lol! 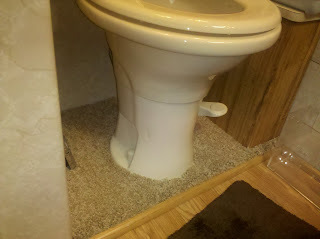 In addition we had to replace the quarter round molding that had been damaged by the water leak. It turned out way better than I had imagined. We are now working on how to transport our two Terra Tadpole Trikes, and my mountain bike. We already have the tandem and two road bikes figured out, and now I think we've figured out the final three "bikes"....I know, I know.....who needs that many bikes? At any rate, once I get the necessary hardware I will share with you have we have solved that mystery. For those of you who wonder what a Terra Trike is, here is a picture taken at the top of Towne Pass (between Death Valley and Panamint Springs) on a 465 mile trip I took with a friend a few years ago. The one in front is mine (with a trailer). Elaine's is the same. We call them "rolling lawnchairs". 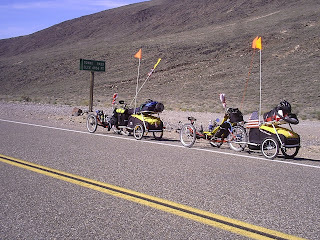 We rode from Furnace Creek (272' below sea level) to the top of Towne Pass (4,956' above sea level) on one leg of this 9 day trip. Anyway, that's what's new in our neighborhood. Thanks for stopping by! We went to bed Wednesday grateful there had been no Santa Ana winds as had been predicted, BUT at 1:30am on Thursday we were awakened by strong winclds grabbing at the still deployed awning....well, that's not good. I woke Elaine (taking down the ZipDee awning is a two person job, especially in the wind!) telling her we needed to get the awning down quick. We threw on some clothes and jumped outside to save our awning. It was amazingly warm for 1:30 in the morning. It took us 3 minutes to put the awning down and put away anything that might blow away, and went back inside. I hate waking up like that...with a little adreniline burst, because I know it will take me time to go back to sleep. I think I fell asleep again around 2:30am, and woke up to bright sunshine around 8:30am....that is late for me! Elaine enjoying the view on Wednesday afternoon. The sky was crystal clear Thursday morning, and, thankfully, the wind had died down. The Channel Islands were clearly etched against the morning sky. After a quick breakfast we put on our bike clothes for our annual ride up the Ventura River bike trail to Ojai, CA. Ojai sits at about 750' above sea level, so the ride from Rincon (sea level) was mostly uphill. The round trip ride from space #119 on Rincon Parkway to Ojai and back was 36 miles. The the weather was perfect riding at 65 degrees. We left the coach around 10am, and arrived in Ojai around 11:30am. It was getting on time for lunch so we stopped at a Starbucks and ordered a couple of the hot Pannini sandwiches. After a nice lunch we began the downhill run back to Rincon. We arrived back at the Newell around 2pm, took showers, and headed outside to sit in the lounge chairs. Since we hadn't had a fire Wednesday night we had a lot of wood left for this night. We started up the fire around 4pm, and sat there watching the evening overtake the day as the stars began to twinkle, and the lights of the distant oil platforms became visible. 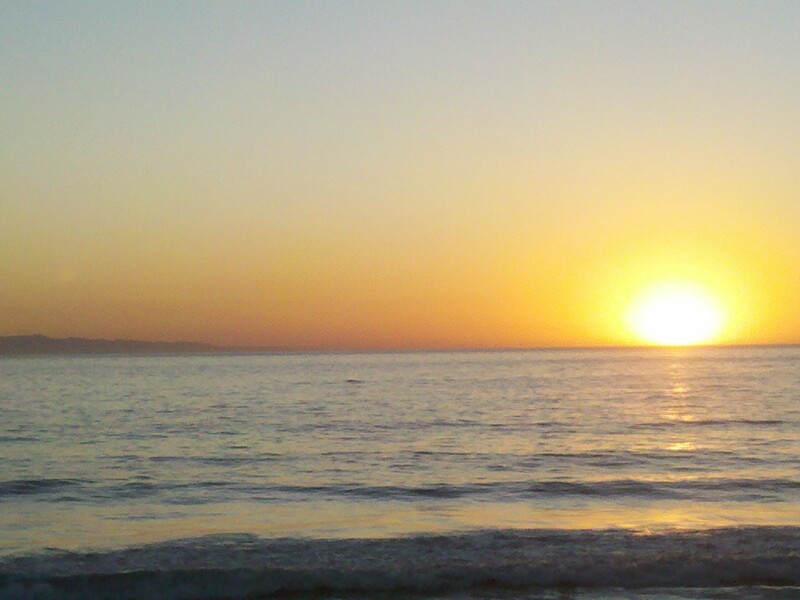 What a great way to end our stay on Rincon. Of course there was a bottle of wine involved, and some Frank Sinatra on Sirriusly Sinatra (XM/Sirrius) channel 71. Since rain was predicted for today, Friday, the clouds were rolling in big time. After dinner we put almost everything away, because we did not want to be loading up in the rain. First thing Friday morning it was still partly cloudy, but no rain, so, in order to speed up the rain I went outside to wash off the windshield...lol! Within 10 minutes it started to rain....works every time! We departed Rincon as the intensity of the rain increased, and headed south on HWY 101 to HWY 126 which takes us through the Santa Paula Valley to I-5, and home. The rain quit as we hit Santa Paula, and it remained dry all the way home. We had barely backed the Newell into site 216 (our permanent site) when it started raining again. The rain continued the rest of the afternoon until around 4pm. Well, we avoided packing up in the rain, but got to unpack in the rain, so our day was complete. The temperature when we arrived "home" was in the low 50's. Well, that's the rest of the story....thanks for stopping by! On Monday we only had two cabins to clean so we hit them early, and were finished by 9:15am. Right after that Integrity Mobile Detail arrived to do the monthly wash and detail on our coach....I like to hit the road in a clean coach. Hitting the road means hitting the road north for Rincon Parkway north of Ventura. 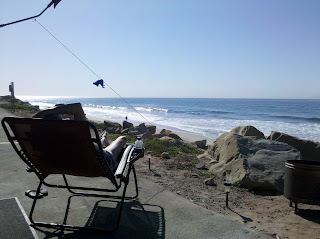 The last time we drove the Newell up to Ventura was last February....almost 9 months! Every time we are here I tell Elaine, "Why don't we come here every month?". The weather in November is always nice, and there are no crowds with which we must compete for a parking spot on the "Parkway". There are 127 50' spots end to end on the Parkway. 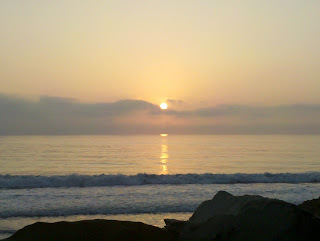 Rincon Parkway stretches about 5 miles from the Sea Cliff exit on the north to the State Beaches exit on the south. It is what is left of the old Highway 1 in this area, which was replaced years ago by Highway 101. The County of Ventura has converted 1 mile of the Parkway to dry camping to the 127 dry camping spots. At either end of this section of the Parkway are two County Parks....Hobson on the north, and Faria on the south. Each of these parks offer a dozen, or so full hookup spots including cable TV. Most the spots in these two parks are just a dozen feet from the surf at high tide. We were able to depart Rancho Jurupa around 1pm.....after a 30 minute stop over at my office to drop off my grandson's BMX bike, which he left behind after his stay with us over the weekend, we entered the 210 FWY and headed west to I-5, and then north a short way to Highway 126, and then west about 30 miles to Ventura and Highway 101. 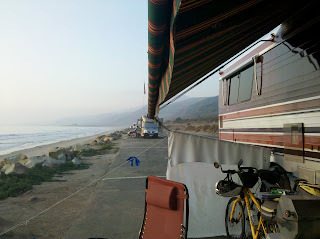 We arrived on Rincon Parkway just after 4:30pm pulling into #119 on the southern end of the dry camping sites. There were probably 2 dozen RV's here when we arrived, and just a few more today (Wednesday). There are 8 empty sites to the south of us, and 2 empty ones north of us, so we are by ourselves. The first night (Monday) there was a very heavy marine layer to the point of a heavy mist falling. 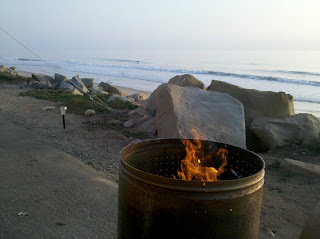 We grilled a couple of filets for dinner and sat by the fire for a while...there wasn't much to see because of the heavy marine layer and fog, but it is one of the things I love about Ventura. 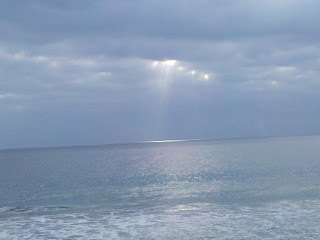 The sound of the ocean drowns out any other sounds. Tuesday morning it was still overcast, but not foggy. I had some insurance work to do, but by 11am we decided it was time for a bike ride. 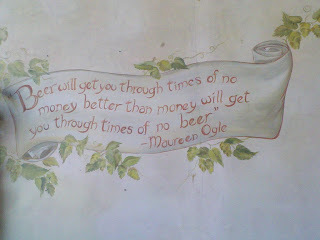 Our destination was downtown Ventura where we always visit Anacapa Brewing Company on Main Street. It is a great, local micro brewery. 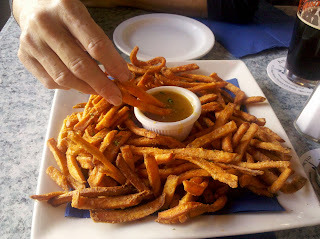 One of their signature appetizers is sweet potato fries with a honey mustard dip. The ride from #119 is just over 7 miles to ABC, and we arrived there after a 30 minute bike ride. We quickly ordered a plate of the fries, and two Porters. What a nice al fresco afternoon spent sipping Porter and munching Sweet Potato fries. We arrived back at site #119 around 3pm and sat in our recliners watching dolphins swim up and down the beach for the rest of the afternoon. Since we had a big lunch we decided to roast some artichokes Elaine had steamed earlier that morning. So, we sat there watching the sun dip lower in the sky sipping wine, and eating artichokes. What a great end to a great day! Today, Wednesday, the forecast called for Santa Ana winds, so we decided to stay close to camp....neither of us likes riding bikes in the wind. As it turned out there was NO wind all day, but it was balmy and crystal clear, which is what you would expect with a Santa Ana condition. 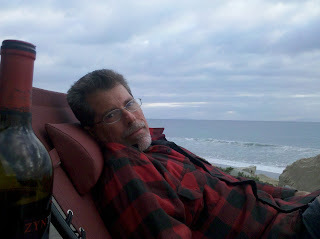 The day was spent sitting in our lounge chairs reading, watching dolphins again, and two long walks on the beach, and a long nap. Elaine had been marinating chicken all day, and soaking sweet corn in a salt brine, so around 5pm I lit the BBQ and cooked the chicken and corn. We watched the sun sink below the horizon once again and sat until well after dark just watching the colors change, the stars and moon come out, and listening to the soporific sound of the never ending waves. We'll be here two more days, and head back to Rancho Jurupa on Friday afternoon. Tomorrow we're thinking of riding up the Ventura River bike path to Ojai for lunch. That's it for today....thank you for stopping by!